Gen 2 U.S. Military specification night vision. Comes with original hard case and mount for AR-15/M16 carry handle. Made in the USA for the Israeli Military. Does not come with battery or battery adapter. A - Like-new condition: Housing and image tube. Functioning reticle. 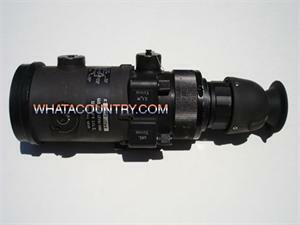 B - Used Good condition: Housing and image tube will have minor wear/blemishes. Reticle may not light up. C - Used Fair condition: Housing will show wear. Tube will have gain/brightness issues and/or other optical blemishes. Reticle may not light up.